We can try but we cannot completely put ourselves in the mindset of another time and place. So the idea that Franz Schreker (1878-1934) was in his day as well-known for his operas as Richard Strauss is startling but then, face it, it is an indication of the total if perhaps momentary later victory of Modernism that Schreker is no longer remembered and even Strauss himself is no longer quite what he might have been 70 years ago. For in the end neither could be considered as a Modernist teleology-figure, a cornerstone in the narrative of the Modernist foundation. In the end all that does not matter in some argument-ending way. We can look and find many composers who may not have contributed directly to the Modernist end-zone celebrations that were so completely convincing in the mid-1960s of last century. And we know today perhaps that no style will ever wipe out what went before, nor should it. And so we can listen to Schreker without thereby buying into any sort of future whatsoever. Schreker's fate we must also point out was tainted by the rise of the Nazi "degenerate" ban that became a tragic roadblock for so many Austro-German composers of the day, indeed most. Schreker was blacklisted. He did not live to see the end of the fascist movement. And his reputation suffered as a consequence. 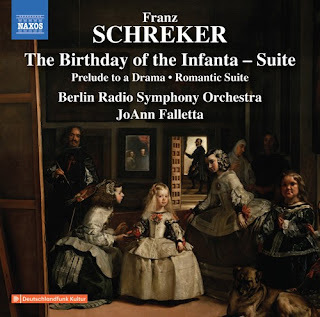 We have plenty to absorb in a new program of Schreker orchestral fare, The Birth of the Enfanta - Suite and other works (Naxos 8.573821) as very effectively performed by the Berlin Radio Symphony Orchestra (Rundfunk Sinfonieorchester Berlin) conducted by JoAnn Falletta. There are three works at hand in this program. And between the three we get a good idea of how inventive a melodist and how sure an orchestrationist was Schreker. His 1914 "Vorspiel zu einem Drama" is a cogent 20-minute slab of music, a concert overture to go with his then-celebrated opera Die Gezeichneten. 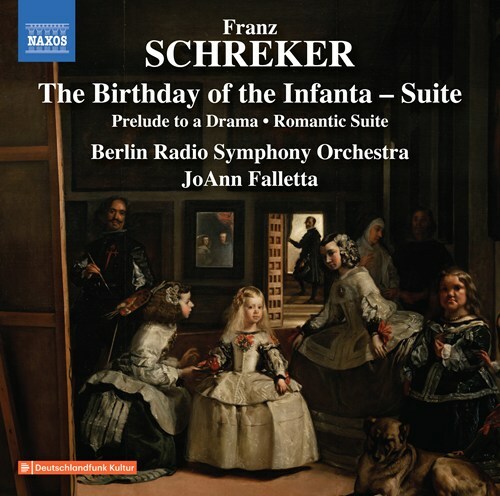 We gather from this, along with the 1923 title Suite "Birth of the Infanta" and the earlier, 1903 "Romantische Suite" a Schreker of Romantic-chromatic originality. We look in vain for the seeds of a Webern or a Schoenberg, but then that is no longer a necessary prerequisite for appreciating an early-Modern-period voice! What is interesting perhaps listening to these fine performances is what Schreker is NOT. He does not sound like Bruckner or Mahler, not even so obviously does he channel the influence of Wagner. For these reasons and for the high spirits of the performances (which we have come to expect when Ms. Falletta is involved) I do not hesitate to recommend this album. Anyone with an interest in the Austro-German Modern scene and the bubbling of the new century 100 years ago will learn from this. And it is a very happy listen!